Criticism is inevitable, and when a man as revolutionary and dynamic as President Rodrigo Duterte holds the highest power in the land, there is bound to be dissent from those who are bothered by his unusual and novel ways. International relations expert and social media personality Sass Rogando Sasot struck a comparison between Duterte and one of America’s greatest and most influential man, former President Abraham Lincoln. While it is lesser known, Lincoln had received an onslaught of criticism during his time due to his brash and uncouth nature which statesmen found deplorable and unfitting for a man looked up to as the leader of a global superpower. Lincoln was tagged in The New York Herald’s article as “a vulgar politician” in contrast to his other genteel rivals, with some writers going as far describing Lincoln as a “third-rate Western lawyer” with bad grammar and a brutal and bloody disposition. Because of the former American president’s “coarse” and “illiterate” style, as an 1860 The Philadelphia Evening Journal article described, Lincoln’s capabilities as a leader was greatly questioned and people had surmised he would amount to nothing more than a “tool of the fanatical host he will lead on”, as written by Boston Post. Most strikingly, the Unpopular Mr Lincoln contained a story as told by Larry Tagg as told by his friend to him that Lincoln was deemed too unsuited for “southern gentlemen”. “Did you think the people of the South, the Lords Proprietors of the Land, would let this low fellow rule for them? No. His vulgar facetiousness may suit the race of clock makers and wooden nutmeg venders — even Wall Street brokers may accept him, since they do not protest — but never will he receive the homage of southern gentlemen..[because they would never submit to rule by a president who] exhibits himself at railway depots, bandies jokes with the populace, kisses bold women from promiscuous crowds,” the article read. 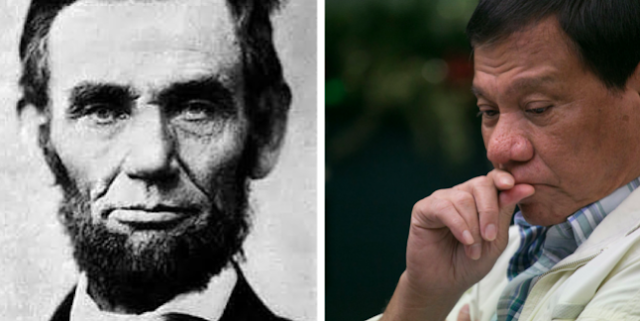 These comments on Lincoln’s manners hit too close to home as Duterte is often criticized for these similar traits. Duterte’s critics also describe him as coarse, uncouth, a lover of colorful language with a needy penchant for expletives, and a no good hilly-billy from the south. He has even been slammed for his taste in jokes and women and his ruthless taking towards crimes and drugs. For all that the critics try to make him be, they seem to miss that Duterte is not for the lofty ideals of the elite, but a man of and for the masses. By striking this comparison, Sasot offers a new perspective into Duterte’s “unclean” mouth by emphasizing that he is a man to be judged by his deeds and not by his words.